Jon managed to sit down with Nathaniel Motte of the double platinum group 3OH!3 prior to their first headlining show in London. Nathaniel spoke to Alter The Press! about the group's success in such a short amount of time, playing the UK, criticism towards the group, the new single 'Starstrukk' with Katy Perry and more. Alter The Press: How does it feel to be back in the UK? Nathaniel Motte: It's been good. All of our stints here have been so short, and I haven't been able to do the whole tourist thing, kind of soak it all in, as we've been here for a week. We had the last three days off, I've got to take the tube and wander around. It's been nice. ATP: How was Reading/Leeds for you? NM: Amazing! We didn't know what to expect and we are huge fans of the festival. The tent was packed, the people were amazing, it was like playing a hometown show. ATP: Did you manage to catch any of the other acts? NM: Leeds, we had to take off really quick to make it to Reading, but I got to see a lot of bands who have been on my list to see. I got to see Radiohead, the one thing I had to do before I die! Passion Pit were amazing, Yeah Yeah Yeah's, Bloc Party, who I've seen before, it’s a great festival. It’s my favorite bands lumped into one. ATP: You're first time here was supporting Katy Perry, how was it? NM: Great. The shows were sold out before we even got on the bill so it didn't give a whole lot of opportunity for some of our fans but we got to make some new ones. We played the Club NME which was crazy, this time round is more our thing. 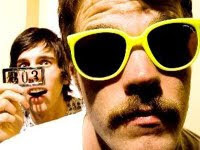 ATP: Describe 3OH!3 to anyone who hasn't heard them before. NM: It's kind of like no holds barred party music, a fusion of electronic, rock and roll with hip-hop elements. It's just a mixture of all that stuff. It's what modern pop music is turning towards, as far as, a lot of mixtures of different sounds and being open to different scenes. ATP: 'Want' - the new record. How would you describe it? NM: 'Want' is kind of a branch out of what this group was. We made a lot of songs in the past, a self-released album before that, we were was a song-by-song band, not album oriented, which is why you find lots of different sounding parts on 'Want'. There are tracks which are strictly electronic, drum and bass, entirely hip-hop or a piano ballad. It's like the different hands of stuff we do but all under the guys of 30H!3, live fun oriented songs. ATP: How does it feel to have so much success in such a short space of time? NM: It's good but we definitely didn't go into expecting it. We started playing and doing shows just for the sake that it was fun, what we wanted to do. We made a CD under the same principal and then we went on Warped Tour (US summer touring festival) and things kind of sky rocketed. It's not to say we didn't take full advantage of the opportunities we were given, we've been on the road for a year and a half. It's definitely work. I am technically homeless and haven't had an apartment for a year and a half now but it's fun. This is a lifestyle that I would never trade anything in the world for. ATP: You're new single is ‘Starstrukk’ remixed featuring Katy Perry. How has the response been already? NM: It’s literally just come out as a single in the US. We are going to shoot the video with her but we are out here at the moment so I have no idea how the single is doing. I think radio has picked it up but, from what I've heard, people love the remix. I love it. It's, in principal, a better song because we've had a year to see what we like or don’t like about it. We added some tones, changed the bridge, I think it's a great song and hope everyone thinks the same. ATP: How would you respond to criticism thrown your way? NM: Obviously, with the amount of success we've had, in such a short space of time, it's easy to get a lot of it and especially by doing something new. I think we've kind of broken those walls down by being smart and reinventing what we are doing. With our live shows, like Reading and Leeds, I've heard only positive things. We love to play live shows, put a lot of work into them and it's fun. Our music is all about fun, at the same time, we put a lot of work into it to make it great. ATP: When can we expect a UK release? NM: It keeps changing but we are back here in November so around then. It's going to be after that. ATP: What is planned after the UK tour? NM: That's finally the breaking point for us to get back in the studio, which we are really excited about. We have been writing on the road occasionally and have written songs with different artists, even worked with Lil' Jon, so we are going to do stuff like that. I want to get in a studio for a real long amount of time and work on some new songs. We are doing the VMAs, up for best artist, which is cool, and are side stage performing with the house band. 'Want' is out November 23rd on Atlantic UK.